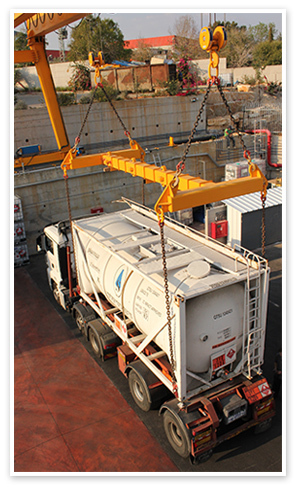 Shitzer Chemicals is licensed to import, store, repackage, transport and deliver HAZACHEM throughout Israel. Strategically located for the optimal handling of chemicals ensures customers receive their chemicals safely, efficiently and just-in-time. The company provides chemicals to any segment in the Israeli industry, including agrochemicals, pharmaceuticals, petrochemicals and chemical processing companies. Standard chemicals, a unique blend, or a tailored chemical mix, from sourcing through repackaging (upsizing or downsizing) and blending to transporting and delivering the chemicals to your site – our team will provide you with the most professional service. With 4,000 square meters of warehouses and a 16,000 SM open yard for bulk storage and containers, our cutting-edge storage facilities and crane are designed to handle and store hazardous chemicals of all classes, 24 hours a day, 7 days a week. Services include repackaging, upsizing or downsizing hazardous liquids or solids, and delivering products using its specialized fleet of trucks.